January/February seems to be my time to make a batch of blueberry wine! One of the first wines I made was a blueberry wine in January, 2006, I made another batch in January, 2007, and here I am again. It does really help when blueberries freeze so well! I really liked how the 2007 batch turned out (see recent review post), so this year, I just want to tweak the recipe a bit. 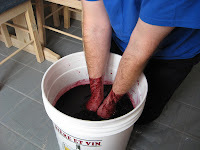 My main objective is to produce a rich, full-bodied red wine, so I'm going to try to extract as much color and tannins as possible with a cold soak, enzyme addition, and yeast choice. I let the blueberries partially thaw on the countertop and then poured 6 L of boiling water over the berries in the fermenter to help set the color. At this point, I got my hands dirty and crushed the berries by hand. The larger cultivated blueberries from Trader Joe's were much easier to crush than the small, wild Maine berries. Fortunately, freezing the berries does a pretty good job in breaking down the cellular structure and release the juice. Boy, does blueberry juice stain human skin--my fingertips were almost black after the squishing was complete! It's hard to see in the picture, but I did put down a layer of plastic so I wouldn't stain my wife's kitchen floor! I added pectic enzyme, as well as Lallzyme EX, which is a pectic enzyme designed for optimal color extraction and stabilization in red wines. I also added the grape tannin, a dose of potassium metabisulfite, and lysozymes to sanitize the must and prevent malolactic fermentation. Blueberries contain citric acid, which is metabolized to acetic acid by ML bacteria and I don't want that in the finished wine. At this point, the raw must had Brix = 7.4 (SG = 1.028), so I added 5 lbs 12 oz white sugar to reach Brix = 23 (SG = 1.094, PA = 12%). I'm a little bit concerned about the acid levels, which were really low at total acidity = 1.08 g/L and pH = 3.45. The must tasted very flat and lifeless. A malic acid tested indicated only ~160 mg/L, so I'm assuming that the rest of the acid is citric acid (good thing I added the lysozyme). I added 8 tsp of tartaric acid (41.3 g) to bring the total acidity = 4.05 g/L and pH = 2.93. I decided to do any more acid additions after fermentation was complete as I'm getting worried about the low pH. Loyal readers will recall that the 2007 batch also had a low pH, but total acidity was ~6 g/L from the fruit alone without having to add additional tartaric acid. At the moment, I'm chalking this up to a difference in Michigan & Maine blueberries. The must tastes good at this point, maybe still a little low in acid, but much improved and much more lively than the starting point. At this point, the must looks like the picture on the right--a lovely dark purple and thick must. I moved the bucket downstairs to the basement for a 48 hr cold soak at 45 °F (New England winters are good for something!). The must is currently resting comfortably, and I plan on letting it warm up to the kitchen room temperature for about 8-9 hours before pitching yeast starter on Tuesday evening. I'll keep you updated with fermentation details! Noel, Im more worried about your arms staining purple than your kitchen? how did you explain that to your lovely wife? Lets get together soon Im off to CA for wine weekend this thursday :) More wine! I have been given some wild blueberry juice which has been flash pasteurized. Can wine be made from this even though it is pasteurized? The colour is very rich. Would I need to add water as you have done? Flash pasteurized simply means that the juice has been very quickly heated to >150 °F or so to kill spoilage microbes. As long as sulfites or potassium sorbate are not listed as ingredients, you should be able to ferment this juice. I have not worked with blueberry juice, but I would assume that it is pretty acidic. Do a total acid titration to determine the acid level. Depending on what your final wine goal, you may need to add water to bring the acid level down. Sweeter wines can handle more acid, while dry blueberry wines are typically around TA = 0.6% or less. Of course, you'll need to add sugar to compensate for the water addition. 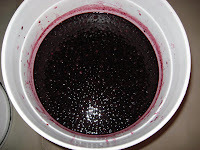 I'm a beginning winemaker and I'm currently fermenting a blueberry batch. I'm on to secondary fermentation now (about 1 week into secondary) I have just recently been reading up on malolactic fermentation. Is there anything I can do at this point to assure this doesnt happen after bottling? Usually, an adequate amount of potassium metabisulfite added to the wine prior to bottling will prevent malolactic fermentation because wild ML bacteria are fairly sensitive to SO2. Add a Campden tablet or 1/16 tsp of k-meta per gallon of wine, mix well, and bottle away. You can also add lysozymes, which prevents bacterial growth. Adding both will ensure no MLF. Good luck on your batch. Keep in touch! I'm enjoying reading your blog. I'm making a blueberry mead with roughly the same amount of fruit per gallon with RC-212. I have heard that this yeast has pretty high nitrogen requirements. Did you use any nutrient to supplement YAN in this batch? I use Fermaid K at 1.5 g/L once active fermentation has begun and then when the sugar level has dropped by a third. I use the slightly higher dosage than recommended for grape wines since I figure that fruit probably don't have the same level or profile of native nutrients that grapes do.